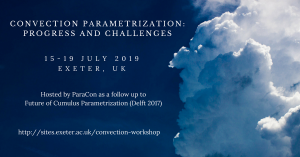 ParaCon is hosting the Convection Parametrization: Progress and Challenges workshop (#CPPC2019) at the Met Office (Exeter, UK) from 15 to 19 July 2019. See our dates page for a list of abstract and registration deadlines. During the workwhop, we will also host a side meeting for informal discussion about the Grey Zone project. The Grey Zone Project supports the development of scale-aware convection and boundary layer parameterisations across the, so-called, grey-zone resolutions of about 200m to 10km, and fosters international collaborations and community activities. Plans and initial tests related to the second phase of the project, which includes a case study based on the EUREC4A field campaign and a yet to be specified deep convective case, will be discussed.